Kandersteg (1200 m) is a traditional mountain village in the Bernese Oberland. It is surrounded by the imposing Blümlisalp range. 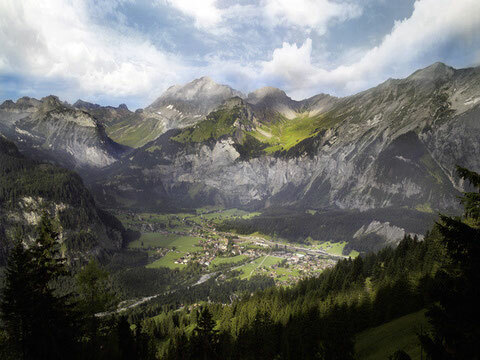 Kandersteg has 1200 inhabitants and is 13 400 hectares in size ( ¾ of which lies in the uncultivated alpine zone). The village was incorporated in 1909. As a result of the construction of the Lötschberg tunnel and the advent of tourism, nearly everyone in the village is directly or indirectly involved in tourism. Kandersteg has approximately 800 hotel beds, 1 200 beds in other guest facilities and accommodation for up to 2000 Scouts during peak periods. More visitors come to Kandersteg during the summer months than in the winter. Kandersteg is an ideal destination for families and others who wish to hike, enjoy the outdoor activities or just relax and avail themselves of the cultural opportunities. There are a variety of hiking trails ranging from pleasant walks to challenging hikes up to the SAC mountain huts, from which the neighboring high mountains can be scaled. Of particular note is the Oeschinensee, a jewel in the heart of the UNESCO World Heritage reserve. Other recreational activities in Kandersteg include mountain biking, rock climbing (via ferrata and climbing parks), Nordic walking, paragliding and much more. 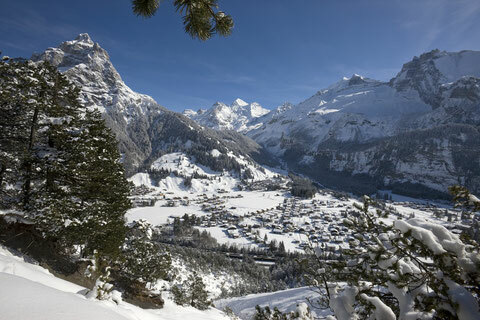 In winter, Kandersteg is a well-known centre for cross-country skiing, winter hiking, snowshoeing, downhill skiing and sledging. You will find ideal conditions for all these activities.